NASA officials found that the space shuttle Discovery's Ku-Band antenna, used in communicating with ground crews and with astronauts on the International Space Station, failed to activate as expected as the shuttle settled into an orbit around the earth this afternoon. The dish-shaped antenna is used for high data rate communications, transmitting video images, as well as working with the shuttle's radar system, with the ground crew and during the spacecraft's rendezvous with the International Space Station. The space agency pointed out, though, that the shuttle has backup systems and still will be able to rendezvous with the space station. It may, however, take a little extra work to make that happen now. Discovery lifted off at 6:21 a.m. EDT today from Kennedy Space Centre in Florida. During a 13-days mission in space, Discovery's seven crew members are expected to deliver some 17,000 pounds of supplies and equipment to the space station. The shuttle is carrying new crew sleeping quarters for the space station's crew and science racks for its various laboratories. NASA noted on its website this that onboard flight controllers are troubleshooting the problem with Discovery's Ku-band antenna, while also working on plans to complete the mission without it if necessary. 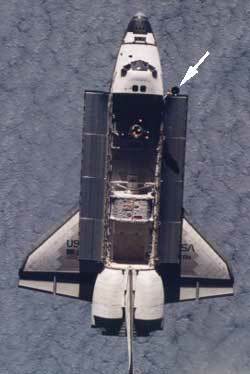 The Ku-Band system is just one of several communications systems onboard the shuttle that can be used to send and receive voice and data. The other systems, S-band and UHF, are operating normally, NASA noted.